“Little Brown Jug” has only two beats per measure (not four). The time signature (2/4) tells you this fact. Learning how to play “Little Brown Jug” on guitar will give you a chance to practice and demonstrate your upstrokes and downstrokes. Play all the fretted notes in the first position by using the same-numbered left-hand fingers as the fret numbers — that is, use the first finger for the first fret, the second finger for the second fret, and so on. Follow the downstroke (the open-bottomed box) and upstroke (V) indications above the tab numbers for downstrokes and upstrokes. The sim. means to continue the same picking pattern for the rest of the song. To play this song, you need to know how to count two beats per measure; how to finger notes in first position; and how to make a song about getting drunk sound suitable for small children. The fact that a bunch of supposedly simple folk songs — tunes you’ve never thought twice about before — now make you feel slow and clumsy as you try to play them may seem a bit deflating. But playing the guitar is a cumulative endeavor. Every technique you pick up, even if you practice it in “Little Brown Jug,” applies to all songs that use those same techniques, from Van Morrison to van Beethoven, from “Moondance” to the “Moonlight Sonata.” Hang in there with the technical stuff and the rest follows. 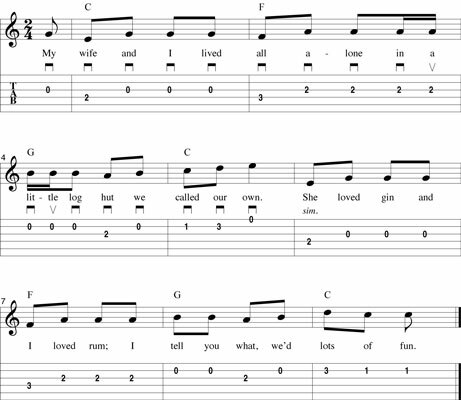 Click here to download and print this guitar tab.